The greatest thing about climbing is that you're never too old or too young to do it. Ever since I started climbing two decades ago, I've had some kind of home climbing wall to play on and train on. Recently, I Googled "kid climbing walls" and found a lot of overbuilt and elaborate contraptions, from dinosaur heads to moving apparatuses straight out of a theme park. I've always found that the best climbing walls are the simplest ones. I wasn't sure if kids would share that same preference for simplicity, however, and when Randy and I were talking about what kind of wall to build for Theo, we went back and forth on the design. I wanted to just screw some plywood onto a blank section in our climbing shed. Randy wanted some kind of angle. 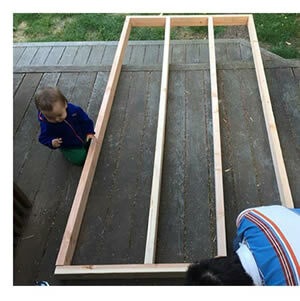 Assemble the 2 x 4s in a conventional wall frame (studs on 16" centers with a top and bottom plate), using 3" screws. Next, screw the sheet of plywood onto the frame using 2" screws spaced about 6" apart all the way around the frame and along each stud. Using a 1/2" bit, drill T-nut holes on 6" spacing, blocking out over the framing boards. Tap the T-nuts in from the backside making sure to keep them straight. Now your wall is finished and you have to decide how to attach it to your support structure, whether that's the wall of your garage or basement, in a shed, an existing climbing wall or whatever. The variations are infinite so I can't tell you how to attach your wall. However, you must be absolutely certain that it solid and safe. Consult a licensed contractor if you aren't sure. We hinged our wall at the top, tilted the bottom out to make a slab and braced it securely in place. As Theo grows, we can slide the bottom in and reattach the bracing to make it steeper. When you build your own wall, please share your pictures here. 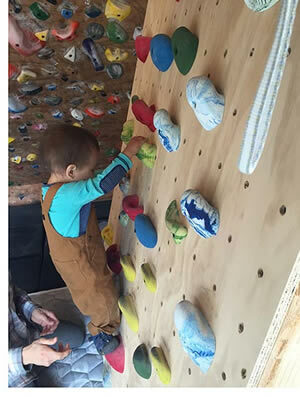 Also, let me know if you have any great tips for climbing indoors with your kiddos.